Wednesday July 27th 1881 I went up to practice this morning and was busy at home doing some sewing in the afternoon and evening. 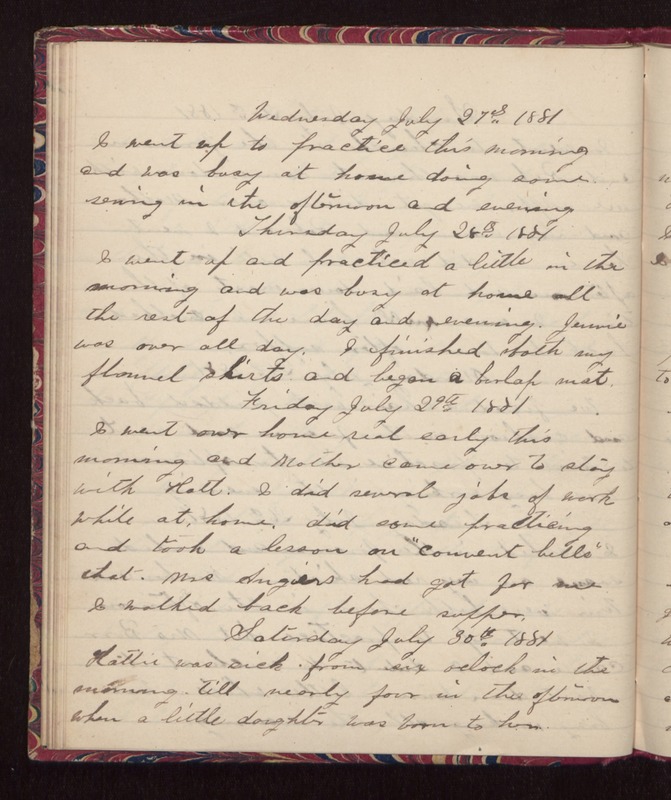 Thursday July 28th 1881 I went up and practiced a little in the morning and was busy at home all the rest of the day and evening. Jennie was over all day. I finished both my flannel skirts and began a burlap mat. Friday July 29th 1881 I went over home real early this morning and Mother came over to stay with Hatt. I did several jobs of work while at home, did some practicing and took a lesson on "Convent bells" that Mrs Angiers had got for me. I walked back before supper. Saturday July 30th 1881 Hattie was sick from six oclock in the morning till nearly four in the afternoon when a little daughter was born to her.